The fourth preliminary day was held at the ASBC Asian Confederation Boxing Championships in Bangkok, Thailand where the goal of the competitors was to advance to the quarter-finals of the event. Mongoliaâ€™s Dorjnyambuu Otgondalai was seeded as No.1 in Bangkok following his gold medal at the Incheon 2014 Asian Games. The 27-year-old Mongolian boxer had to start his competition with Indonesiaâ€™s Farrand Papendang who claimed bronze medal in the Southeast Asian Games in Singapore. The Mongolian boxer used his best weapon counter-attacks in the opening round but sometimes he also tried to control the contets. He was too quick for the Indonesian boxer and his strength was also god enough therefore Papendang needed some medical assistance in the ringside. Otgondalai won the bout by unanimous decision and advanced to the quarter-finals in Bangkok. Thailandâ€™s Pachanya Longchin was the host nationâ€™s first boxer who had to fight in the competition in Bangkok. The Lightweight class (60 kg) boxer is very inexperienced in the international level while his first opponent AIBA Teamâ€™s 19-year-old Manish Kaushik had even more bouts during his whole career. Both boxers are southpaw but with very different style and skills. The Indian boxer used his longer hands to keep the distance against the powerful Thai athlete tried to find his best range. Longchin did a powerful final round and his efforts are enough to win the bout by unanimous decision. Iranâ€™s China Open Tournament winner and ASBC Asian Confederation Boxing Championships bronze medallist Golara Forootanâ€™s will dominated the third bout of the day when he met with Sri Lankaâ€™s Jeewantha Wimukthi Nisshanka Bamunu. The Iranian boxer proved top quality of infighting in the contest against his inexperienced Sri Lankan rival who was brave and great result that he could fight until the final gong. Uzbekistanâ€™s two-time National Champion Elnur Abduraimov received the right to fight for his nation once again after his unsuccessful participation at the Incheon 2014 Asian Games. He had to meet against a top rival Jordanâ€™s Obada Al-Kasbeh who claimed bronze in the Incheon 2014 Asian Games and he was runner-up in the last edition in Amman. Both boxers were born in 1994 but has got great experiences in the international level. Al-Kasbehâ€™s first stopping punches were successful several times in the opening round and tried to control also the second three minutes. Abduraimov had an incredible final round and he could turn back the contest which was one of the highest level in the fourth competition day in Bangkok. Vietnamâ€™s Nguyen Van Hai began his competition in Bangkok with a triumph while on his second contest in the championships he continued his great performance against Pakistanâ€™s Qadir Khan. The 27-year-old Vietnamese boxer had a good rhythm in the bout and tried to fix his best attacking positions in the second preliminary round. Nguyen worked well and advanced to the quarter-finals which is his career highlight in a big event. Japanâ€™s Presidentâ€™s Cup gold medallist and AIBA Asian Olympic Qualifiers bronze medallist Daisuke Narimatsu arrived to Bangkok as a favourite. He was not enough shape in his opening bout against Turkmenistanâ€™s Hursand Imankuliyev but finally he was able to win that difficult match. The Japanese boxer had to box against Kyrgyzstanâ€™s Akzhol Sulaimanbek Uulu who was a competitive rival to him. Narimatsuâ€™s footwork was much better than in his opening contest but the Kyrgyz boxer also raised the rhythm from the second round. The final verdict of their contest was unanimous decision to Narimatsu but the Kyrgyz boxer also proved top performance in Bangkok. DPR Koreaâ€™s National Champion Kwon Chol Guk moved up to the Lightweight class (60 kg) and started his bout with different rhythm than Iraqâ€™s Ammar Jabbar Hassan. The Korotkov Memorial Tournament silver medallist North Korean boxer attacked more in the first round and the fighting spirit dominated in their bout. Kwon won the bout by unanimous decision as he won all of the rounds as the scoring of 10:9. Kazakhstanâ€™s WSB Team Champion and two-time National Champion Zakir Safiullin and Philippinesâ€™ Incheon 2014 Asian Games silver medallist Charly Suarez, who fought at the AIBA Pro Boxing, are both top level fighters but they had to meet in the last 16 in Bangkok. In the first tactical round Safiullin had better punches while both have got world class footwork in the whole length of their early final. Suarez had lethal punches in the second round while Safiullin was still enough fresh in the final round to eliminate the Filipino boxer who was Seed No.2 in Bangkok. Turkmenistan began the ASBC Asian Confederation Boxing Championships with great performance and their next fighter who was in action also tried to do his best. Turkmenistanâ€™s National Champion Azizbek Achilov had a tough rival Tajikistanâ€™s Navruz Jafoev who claimed silver medal at the 2013 ASBC Asian Confederation Boxing Championships in Amman but at the Middleweight class (75 kg). Jafoev began the bout better but Achilov had also strong punches in the second part of the opening round. Tajikistanâ€™s boxer received a warning from the referee in the second round and finally Achilovâ€™s hand was raised after the end of the bout. In the second bout of the Light Heavyweight class (81 kg) Sri Lankaâ€™s Ajith Nevin Gallage Fernando was defeated by Pakistanâ€™s Awais Ali Khan. Kyrgyzstanâ€™s Chyngyz Borbashev won three international tournaments in the current year and returned to the sport in top shape. He defeated also Jordanâ€™s ASBC Asian Confederation Boxing Championships silver medallist Ihab Darweish Al-Matbouli in a close bout in Kazakhstan some months ago. On their re-match in Bangkok Al-Matbouli started better but Borbashev had strong punches in the second part of the battle which was a really spectacular one. Jordanâ€™s No.1 did his very best in the final round but he was a bit tired after the hard battle. His efforts were enough to beat the Kyrgyz boxer which was a revenge. Tajikistanâ€™s former Asian Games winner and two-time Olympian Jakhon Qurbonov is a strong athlete but sometimes he did not do his very best in the tournaments. The 29-year-old Central Asian boxer tried to control the first round against Koreaâ€™s Golden Belt Tournament bronze medallist Kim Ji Ung. The Tajik boxer was tired in the final round but his efforts were enough to keep the advantage until the final bell. Mongoliaâ€™s Daivii Otgonbayar competed in several international events between 2002 and 2005 but following his retirement he decided to return to the sport last year to box at the Incheon 2014 Asian Games. The 34-year-old Mongolian boxer fought for the last eight against Pakistanâ€™s Mehmood Ul Hassan who boxed only in national level events previously. Otgonbayar could not use up his height advantage well while his Pakistani opponent had wonderful fighting spirit and his hooks reached the target are which meant Hassan advanced to the last eight in Bangkok. Syriaâ€™s Manaf Asaad appeared in the international level in 2009 when he was only 18 but this time he had to sub their Asian Games winner Mohammad Ghossoun. The Syrian boxer started the bout better and he knocked down his Chinese rival Yu Fengkai in the second round but before the final one he injured and lost his bout in Bangkok. AIBA Teamâ€™s Commonwealth Games silver medallist Manpreet Singh dominated his contest over Sri Lankaâ€™s Nuvan Sugeewa Sampath and secured his place in the last eight. Uzbekistanâ€™s Bakhodir Jalolov won international tournaments in Kyrgyzstan, Belarus and Germany this year and arrived to Bangkok in top shape. The two-time Uzbek National Champion had to fight for the last eight against Kyrgyzstanâ€™s ASBC Asian Confederation Boxing Championships bronze medallist Sergei Parenko who moved up one weight class just before the start of the event. Jalolov was 30cm taller than his Kyrgyz opponent who could not reduce the fighting distance while the Uzbek boy worked from longer distance. Jalolov operated with excellent jabs and won the bout by large margin of points. DPR Koreaâ€™s Korotkov Memorial Tournament bronze medallist Ri Jin Hyok tried to do his best against AIBA Teamâ€™s Satish Kumar who was quarter-finalist in the Almaty 2013 AIBA World Boxing Championships. North Korea did not send boxers to any major events in the Super Heavyweight class (+91 kg) since 1991 but their giant was not enough brave to won the bout in the fourth competition day. 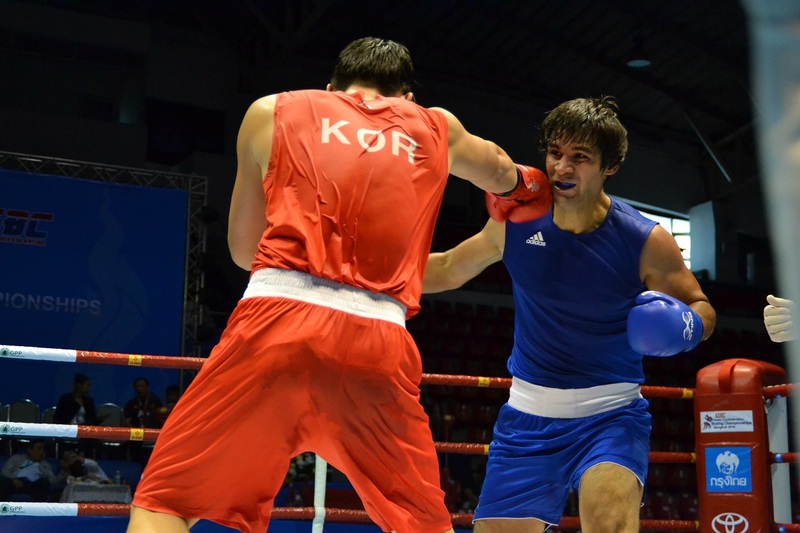 Iranâ€™s Abdolmajid Sepahvandi was silver medallist in the 2011 edition of the ASBC Asian Confederation Boxing Championships in Incheon, Korea and now he regained his place in the national team. His opponent was Koreaâ€™s Golden Belt Tournament silver medallist Song Hwap Yeong who could not stop the continuous Iranian attacks. Sepahvandi had better punches in the bout and deserved his quarter-final place. The continental competition will be continued with its fifth preliminary day tomorrow when 32 bouts will be held in Bangkok. The fights will be starting at the 1pm local time.